In 1980, Vietnam had an estimated 2,000 wild elephants within its borders. That number has plummeted to less than 100 today. One reason for the sharp decline has been the country's lax stand on environmental ethics. Many of Vietnam’s pachyderms have been captured and taken into captivity (expert estimates place the number in captivity around 80). And even the “wild” animals in the country's national parks are often in a quasi-captive state, in which they are utilized for such activities as giving rides to tourists. Now one park, Yok Don National Park in southern Vietnam near the Cambodian border, has taken steps to reverse those trends and advance a form of ethical tourism. In fact, the decision by Yok Don (the largest nature reserve in Vietnam) to ban elephant rides will comprise the country's first ethical-elephant experience. 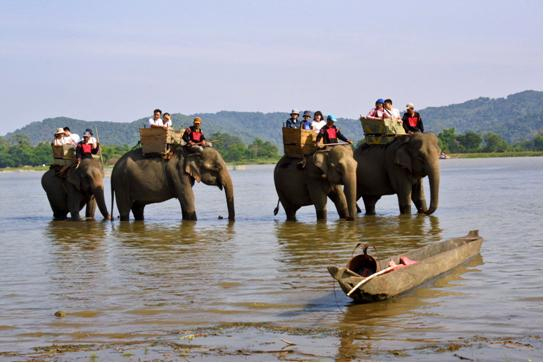 Aided by the NGO Animals Asia, which advocates for animal welfare and tourism in Vietnam (as well as China), the initiative "could change the face of elephant tours in the country." Now visitors will be able to watch Yok Don's four elephants in their natural environment — without saddles for tourists. Before the initiative started, the four elephants — Thong Ngan, a bull in his mid-20s, and three females, H’Non, Bun Kham and Y’Khun — spent their days in chains. "They worked for nine hours a day," reports Animals Asia's website, "and while chained had no access to water, were unable to touch each other or express natural behavior such as roaming, dusting, mudding, scratching parasites from their skin or foraging as they would in the wild." But a successful and sustainable advance in ethical tourism will only take place if the venture is beneficial not just for the elephants, but also for elephant owners.